Four second-half goals in the space of 10 minutes ended Berwick Rangers’ direct interest in this season’s Irn-Bru Challenge Cup competition. Jonny Fairbairn was recalled and there was also a place for new loan signing from Hearts, Marcus Godinho. He looks to be a player with plenty of self confidence and certainly had a good first half, despite being the first of two home men to pick up a yellow card – Jordan Orru was the other in the second half. Three of Berwick’s other loanees, Donaldson, Waugh and Irving, missed this one as they did the first-round tie at Kilmarnock. Darren Lavery was out with tendon trouble and from the starting XI the previous week at Cowdenbeath, neither Chris McDonald nor Gary Phillips played though the former was on the bench. Berwick more or less matched their full-time Championship opponents in the first half but the effort involved in doing so took its toll and was one cause of their second-half collapse. Neither side had many real scoring opportunities during the opening 45 minutes. Berwick’s best fell to Greg Rutherford in the 11th minute. Rangers headed away a free-kick from Queens’ Callum Tapping before Kevin McKinlay sent an excellent cross over the heads of backtracking QoS defenders to Rangers’ front man who went for a first-time shot. It looked good enough to beat Jack Leighfield but to ‘Oohs’ from home fans ran beyond the far side of goal. Rangers’ only other shot of note followed a build up involving Godinho and Michael McKenna. Murrell, with back to goal, managed to turn to test Leighfield, the pink-clad goalie unable to take the ball cleanly at the first attempt. 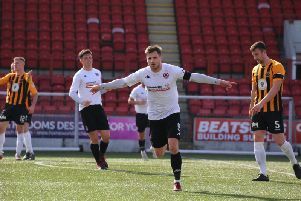 In the middle region of the home half, Pat Scullion’s pass intended for McKinlay lacked sufficient power to reach his team-mate, enabling Tapping to take the ball forward but not far enough. With no-one close enough to challenge, his long, way-off target effort was greeted with groans from the travelling support. On another occasion when Berwick conceded possession, Stephen Dobbie fired over the bar. With a later attempt, he aimed straight at Robby McCrorie. The goal glut began eight minutes after the break. Derek Lyle supplied Shaun Rooney as he ran through the defence and the Blues No.2 hit the ball high into the net. Five minutes later, Dobbie easily passed two defenders to slip the ball past McCrorie’s left. On the hour, Dobbie had a hand in the next one, finding another big hole in the home rearguard for Lyle to finish. The ten minutes of torment culminated in Dobbie’s pinpoint precision ensuring that his cracking shot from outside the box ended up just inside the post. Urged on by Stevie Notman, Rangers rallied a little after this. Steven Thomson juggled the ball before forcing Leighfield into a save and then curled another ball around the far post. However, Queen of the South again flexed their muscles and even with two men trying to pay him close attention, Dobbie got the ball away to John Rankin only for him to sweep it over the bar. This was also the destination of a header from centre-half Darren Brownlie. Sub Christopher Kane was on target after running on to a through ball. If there was any suspicion of offside, deflated Rangers’ players made no attempt to appeal and were probably glad to hear the final whistle three minutes later.